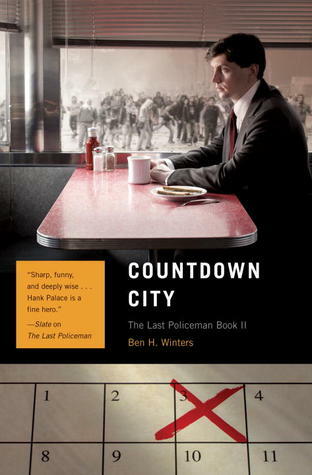 Countdown City by Ben H. Winters is the second novel in a trilogy. The first book, The Last Policeman, introduces the reader to a doomed world and a cast of characters. Countdown City by Ben H. Winters finds the world 77 days before a huge meteor will hit and will end life as we know it. As expected many people are going nuts, the government declares (basically) martial law and no one is really paying attention unless you have a gun. Our hero, ex-policeman Hank Palace, does have a gun and a sense of duty and purpose but he starts losing hope as it becomes more clear that the inevitable is about to happen. The characters around Hank start speaking as if they outside the novel, but can talk to the protagonist, basically telling him to stop being so naïve and start facing reality. The mystery is farfetched and the author asks the reader to take a leap of faith when it comes to the plot. Palace eye sight must be superhuman for him to observe all the miniscule clues and leaps in logic – but that’s not what the story is really about so he gets a pass. This is another well written, interesting book where the storyline takes second place to the descriptions of a soon to be doomed world and how society falls apart at the seams. Mr. Winters narrative is well written, easily read and creates a thrilling world. Hank Palace used to be a police officer with the Concord, NH police department, however the world is coming to an end and the PD has been federalized. Hank still has a sense of purpose, and when an old friend asks him to find her missing husband he takes on the challenge. How can he find someone in a world with no gasoline, no phones, no way to tell if the husband is simply fulfilling his wishes before he dies. I liked this book two and I’m interested to see how the trilogy will end.